Mars exploration isn’t all about Curiosity and Opportunity rovers. NASA’s Mars Reconnaissance Orbiter has snapped loads of beautiful hi-resolution images of the red planet's surface since 2006. The spacecraft, which is operated by the University of Arizona, is equipped with a $40 million HiRISE (High Resolution Imaging Science Experiment) camera. The device is the largest aperture reflecting telescope ever sent on a space mission, and is capable of taking 0.3 megapixel pictures. 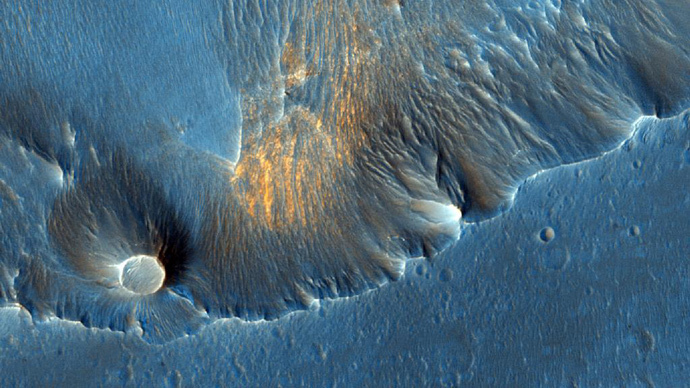 Mars is known as the red planet, but the HiRISE images have been enhanced by ‘false coloring,’ which helps scientists track changes on the planet’s surface. 1. The Noctis Labyrinthus, or 'Labyrinth of the Night,' received its name due to its steep-walled valleys which intersect to resemble a maze-like structure. 2. The eroded badlands at Aram Chaos, a vast crater near the equator of Mars, have been nearly filled with sedimentary rocks. 3. The so-called ‘inverted crater’ in the Arabia Terra region of Mars spans about 250 meters in diameter. 4. One of the first sand dunes to be discovered on Mars was found by scientists inside the Proctor Crater. 5. The rich clay deposits of the Nili Fossae region make it one of the most attractive areas for Mars researchers, as they provide conditions allowing organic materials to be preserved. 6. A giant snake-like dune, or barchan, in the Hellas impact basin of Mars was formed due to winds blowing in the same direction for a long period of time. 7. A fresh crater is seen on the Martian surface, complete with colored dust which was kicked up during an impact. 8. The Curiosity rover (lower left quadrant) and the tracks it laid on the surface of mars, as shot by the HiRISE camera. 9. A high-flying dust storm was pictured from orbit in the Amazonia Planitia region of Mars in late spring. 10. Dust devils leave twisted and fascinating tracks on the sandy surface of the red planet.